ABOUT THE MAGENTO 2 CMS BLOCK SCHEDULER EXTENSION. The Magento 2 CMS Scheduler Extension is a powerful solution to manage and target content displayed to customers. The best part? It’s as easy as a few clicks. By using our extension you will enhance default functionality of Magento CMS blocks. Schedule and target the visibility of blocks, banners, promotions, & events ahead of time. Big sale launching at midnight? No need to stay up late to change the banner, you can simply set it ahead of time. You gain full control and automation over all visible static blocks on the front end. 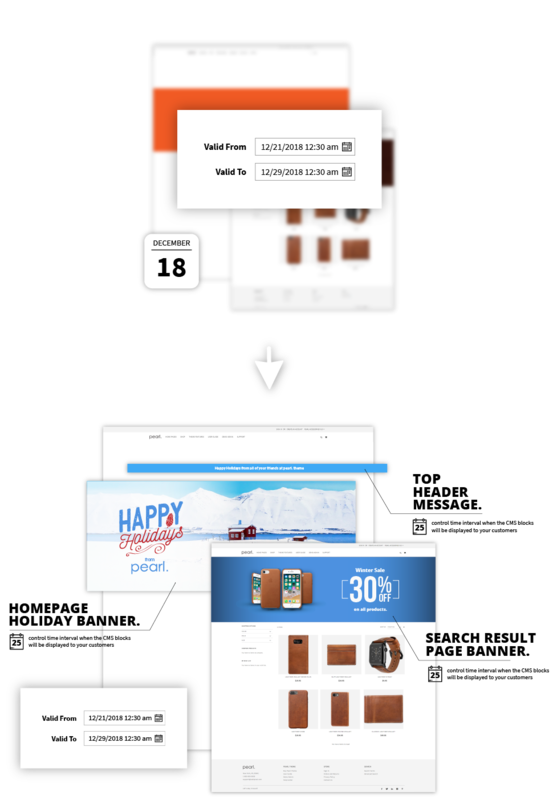 This extension for Magento does a whole lot more. It provides relevant content for visitors by targeting customer groups and automatically displaying call-to-action content for assigned time intervals. Providing relevant targeted content will undoubtedly lead to a significant increase of your conversion rate and this extension provides you just the right tools to achieve that. It also helps you to plan promotions ahead of time. First prepare all necessary homepage banners, category page promotions, and cart call-to-action content. Then simply schedule the promo-based content visibility for the specific date and time. Don’t worry about blocks being visible after the sale ends - the extension makes sure the blocks are disabled on time. The extension features auto enable and disable - blocks will become visible when the promotion starts and disappear when it’s over! Target your customers and show customized content blocks based on their assigned customer group. You can also give product or purchase recommendations and add “motivation” campaigns to encourage customers to purchase. Custom block content can be that final nudge to convert right at the moment of buying! Schedule the store in advance to look and feel different for each customer group, promotion, event, or period of the year. You can base this on Date & Time, Customer Group, and Store View scheduling. Each block can be tagged and assigned to a customer group, promotion, or period of the year for easy filtering and control. Magento admin panel is where the magic happens. From here you can schedule visibility for each CMS block, as well as when, where, and to whom it is displayed. Once you enable extended options such as Date Range, Customer Group, and Tags, they will become visible in all CMS block forms. By enabling Date Range control, new fields 'Valid From:' and 'Valid To:' will be activated in CMS block forms. By filling in the valid interval you control the when this block will be visible in store-front. By enabling Customer Group control, a new multi-select field 'Customer Group' will be activated in CMS block forms. By selecting customer groups you control frontend visibility for selected groups. Options can be combined in order to offer enhanced flexibility for custom content control. By enabling Tags, a new field named 'Tag' will be activated for CMS blocks. Tags name can be pre defined with promotion names, or any custom name, and assigned to each block for easy filtering. The Magento 2 CMS Block Scheduler Extension works right out of the box! Simply install it to automatically activate Date Range, Customer Group, and Tag control for blocks. If you wish to use only specific scheduler features you can go to extension options and activate just the ones that you need in the scheduling process. FEATURES OF THE CMS BLOCK SCHEDULER EXTENSION. Control when you display the content - control time interval when the CMS blocks will be displayed to your customers. Display relevant content to your visitors - target your audience & display the blocks to a specific Customer Group. 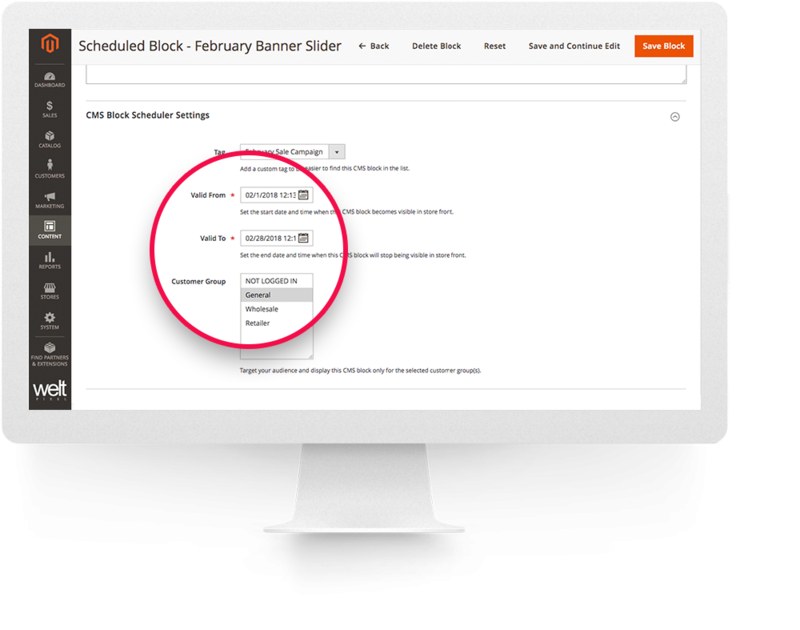 Filter through hundreds of CMS blocks easily by using our tagging system, group blocks to each promotion or event. Quality code, respects Magento best practice. Before installing CMS Block Scheduler on a Magento 2 store please check the extension compatibility. This extension is currently compatible with the following Magento versions 2.1.x - 2.3.1 It is recommended to install the extension first on a testing server before you install it on a live (production) server. Step 1. Remove extension code under app/code/WeltPixel/CmsBlockScheduler before adding the new extension files. The extension may be refactored and old unused files may cause random issues so it's best to only keep the latest version of the files. Enable Tag [Yes / No] - Enable tags for CMS Blocks and Widgets, this will allow to add a tag to each block or widget, link it to a promotion or event and easily find it when necessary. Enable Customer Group [Yes / No] Enable Customer Group - lets you select to which customer group to display a specific CMS block. Note: Once above features are activated, scheduling will be available under CMS Blocks options. This tab allows you to define the Tags to be assigned to CMS Blocks or Widgets. You can group them by promotions, period of the year or any relevant tagging system that will allow you to find and schedule all blocks associated to a specific event. Type the name of the Tag which can be used for tagging CMS Blocks or Widgets. By pre-defining the tag names, and assigning the tags from a dropdown selector you will avoid typo errors while using the tagging system. The tagging system can also be used for the widgets from your store, not only for CMS Blocks. In Admin -> Content -> Widget select the widget to be Tagged and select from a tag previously created in 'Manage Tags' section of the extension. Tag Set a Tag to the block. Tag needs to be previousely created in the Manage Tags section. Filter widget and blocks using tags. Tags can be set to all Blocks & Widgets. Filter blocks & widgets by Tag ID number and you will be able to find all Blocks and widgets associated with that specific tag. Fix for customer groups admin save error in CMS bocks. Added compatibility with Pearl Theme and WeltPixel extensions. Code refactoring, extension name changed, the extension is not compatible anymore with Magento 2.0.x version, only 2.1 and above. For Magento 2.0.x compatibility, version older versions should be used. You're reviewing:MAGENTO 2 CMS BLOCK SCHEDULER AND TARGETING.